Emotional support dogs vs. service dogs - what's the difference? Emotional support dogs vs. service dogs – what’s the difference? Dogs are often used as service animals to help the disabled navigate their daily lives more easily. These dogs are specially trained to do well-defined tasks that individuals cannot do themselves. Dogs can also provide emotional support for individuals who experience psychological or emotional conditions. These two animal-related activities are under different legal definitions in regard to access and accommodation. So let’s take a look at the comparison between emotional support dogs vs. service dogs and see what the difference is between them. Service dogs are individually trained to do certain tasks that a disabled individual may require in their daily activities. These animals may be the arms and legs, eyes and ears of people who have impairments in these areas. Service dogs can also help individuals who have mental illnesses that impair their activities in daily life and constituted a real disability. Psychiatric service animals (PSAs) may be trained to help steady individuals who become dizzy from their medications, clear airways from individuals who have vomited from seizures or ensure that disoriented individuals do not wander into traffic. These are specific tasks that an animal must learn to provide assistance to an individual, and the animal is given special legal protection because of their service. An emotional support dog does not receive this specific task-oriented training. The animal generally learns only the basic commands and skills that are required to make it a good companion and a good canine citizen in the community. Although the dog may respond to an individual’s emotional upset, this activity is a reaction and not a trained behavior. The dog provides the emotional support and companionship an individual with emotional impairment may need, but it does not do specific tasks to help the individual function in a broader context. Service dogs are allowed to enter any facility with their impaired owners, as would other people. 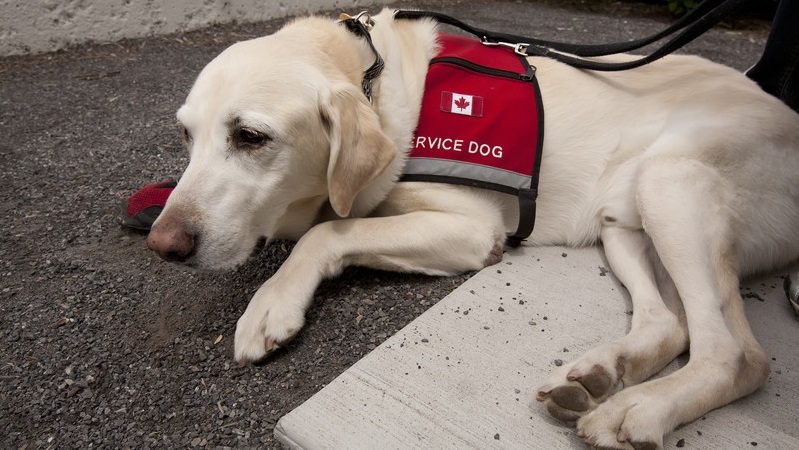 The service dog is considered a legal accommodation to a disability that is protected by law. Landlords who have a “no pets” policy must accommodate service dogs, as these animals are considered necessary to the normal function of their owners and are protected under disability laws. When out in public, people are advised not to talk to or pet service animals who are considered to be “on the job” caring for their owners. Distracting the animals could interfere with their ability to provide assistance and could even endanger the owner. Emotional support dogs are covered under disability accommodation laws in regard to housing because they allow the person the “full enjoyment” of the residence. However, emotional support animals do not have to be accommodated in public facilities or privately owned stores, conveyances or other venues. Although the animal may be therapeutic for the individual, it is not considered necessary to normal functioning. A service dog provides specific physical assistance to disabled individuals. These animals enjoy greater legal accommodation to housing and public facilities because of their rigorous training. Emotional support dogs provide an important service to impaired individuals, but are not considered necessary for their owners’ care. These difference may seem small, but they are important to organizing when and under what conditions animals can be allowed to mix safely in public spaces. It’s interesting to read about the differences between service dogs and emotional support dogs. It makes sense that somebody with a disability might require a dog to help them with daily activities. It’s something to remember because my wife wants an emotional support animal and I think getting her one could be good.